Gustavo Castro Soto is a Mexican sociologist who has dedicated his life to the defence of land and the environment. 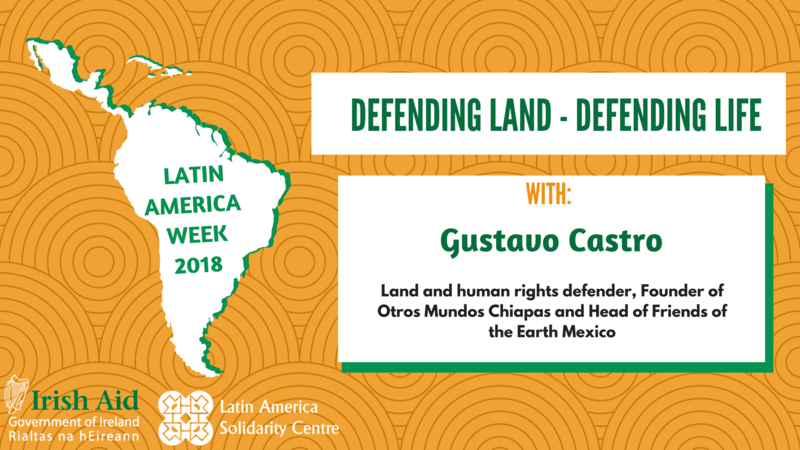 Gustavo is a founder of Otros Mundos and Head of Friends of the Earth Mexico, organisations that are seeking new formulas to protect the environment and promote a more just, equal and peaceful world. Gustavo was a friend and long-time supporter of Berta Cáceres, founder of the Civic Council of Popular and Indigenous Movements of Honduras (COPINH). Gustavo was the sole witness to Berta’s assassination on 2nd March 2016, having himself been shot by the gunmen and left for dead. Following the murder, Gustavo was declared a protected witness but was illegally detained in Honduras for a month under suspect legislation. He is now living in exile in Europe and we have the honour of hosting him on the evening of Wednesday, 11th April 2018. The imposition of destructive extractive projects and an unsustainable economic model is an issue very relevant to us locally, as it is globally. The discussion with Gustavo Castro about the strength of the community and the courage of people who stand up to protect our earth will be an intensely interesting and inspiring one. We hope you will join us. This talk is supported by Friends of the Earth Northern Ireland and the Centre for Global Education.